Are you looking to boost your career? Are you a manager or an entrepreneur? Make a career move that really counts. EDHEC Executive MBA (EMBA) will give you the stimulating learning environment you need to acquire a global business outlook and successfully achieve the digital transformation of your company. EDHEC Executive MBA programme will give you the know-how you need to drive your organisation’s performance and consolidate your leadership. EDHEC Executive MBA core courses address all the disciplines that underpin corporate management to give students the tools they need to master all the key aspects of strategic and business management. The core courses are delivered in English by EDHEC teaching faculty and professional experts. 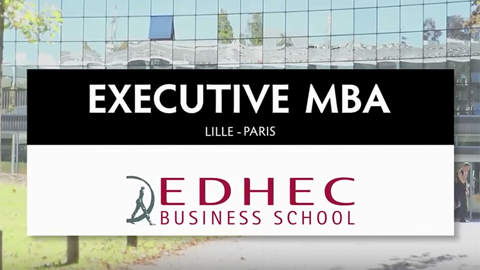 EDHEC Executive MBA programme offers a wide choice of top level business options on the Lille and Paris campuses to consolidate your skills and provide you with new perspectives on management issues. You can choose up to 6 different electives covering a total of 90 hours. To help them gain a better understanding of the challenges raised by globalisation and how to deal with them, the students take part in 2 Global Business Trips. The Global Business Trips help you explore how economic and political models work in relation to western models, understand the mechanics of competition, and identify key business success factors. The trips also help you to step back, develop strategic sensitivity and acquire new managerial reflexes in project and people management. Conferences to understand the country’s cultural environment. In-company visits and discussions with local managers to link theory with practice. Team workshops to draw up the Global Business Report. At the end of the business trip, students form teams to write a detailed report on an industry or company of their choice: the Global Business Report. This report gives them the opportunity to gauge the insights acquired during the business trip, and to demonstrate their ability to apply the tools presented during the course to real-life conditions. To anticipate the trends emanating from the new market economies and identify alternative management models. To develop the ability to "think strategically" by adopting a cross-sector approach and synthetic thinking, examine competitive trends in an environment with little information by learning to decipher weak signals and rumours, and enhance strategic sensitivity by making intuition a factor in decision making. The project involves moving from thought to action and formulating strategic recommendations for the company of your choice. The EDHEC Executive MBA consulting project consists of drafting recommendations , in the same way as a real consultant, on a concrete topic linked to your career plan and that is useful to the business organisation. It may concern the company you work for, one of its customers, or a company that you would like to found or take over. It involves both a long-term take of the future and a real understanding of the present, demonstrating a keen sense of reality that combines good sense, reaction and action. You will be supported by both a coach and a member of the teaching faculty in this exercise, and will discuss the work with the other members of your team. To help consolidate the theory acquired during your study programme and put it into practice. To acquire a problem-solving methodology with a strategic bias (project management, framing a problem, diagnosis methods, developing and communicating proposals, etc.). To develop formal strategic and cross-sector recommendations for a real management issue, similar to those you will develop later on. Students defend their consulting project orally in front of a 2-person panel who examine the clarity and thrust of the diagnosis as well as the relevance of the recommendations envisaged. EDHEC Executive MBA programme puts great emphasis on collaborative activities to help develop your leadership skills and strategic prowess. A series of seminars complete the group dynamics with a human-sized class located on the Lille and Paris campuses, with the aim of enhancing personal efficiency and decision-making skills. Dozens of case studies, often based on professional issues that members of the team have come up against, mean that you debate your ideas and formulate joint recommendations. In this active learning context, the teamwork activities hone your leadership skills and help you to understand how an efficient team works and the best attitude to adopt to boost your team’s performance. EDHEC Executive MBA combines dense and high performance learning with intense tailored support. Students are given personal tutoring to complete their project and develop their leadership so that later on, they can shoulder their responsabilities fully and serenely. Two additional sessions will help you to customize your approach to the "decision-making" module. Expert Talk - Denis DAUCHY: "Reinventing your business model requires creativity"
Develop your professional transformation through the innovative and relevant action learning input. 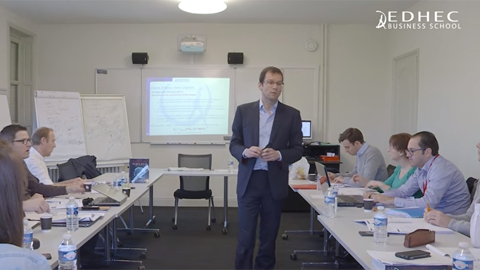 EDHEC Executive MBA is a balanced programme that combines serious academic input with a hands-on approach to the real challenges of business life. 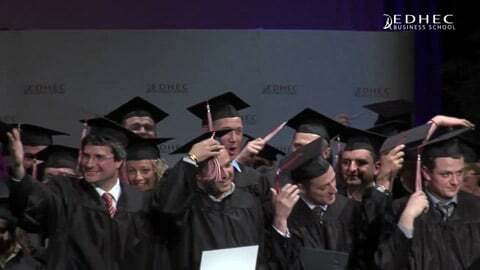 The EDHEC Executive MBA learning programme is underpinned by international academic experts and business professionals. "The learning environment that we’ve designed will help you to develop a global and novel outlook on the business world, and to consolidate your management and entrepreneurship skills in order to reinvent your personal trajectory and that of your firm." 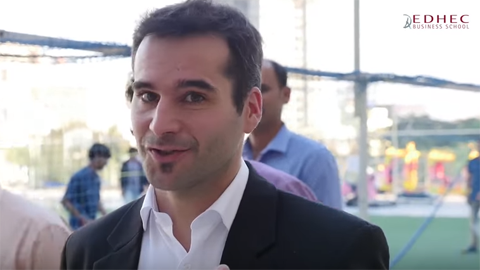 I chose EDHEC as I was looking for an MBA that offered a truly interactive experience and I wanted to develop relations with the other members of my class. I really appreciated being able to exchange ideas in an environment that encouraged discussion. EDHEC Executive MBA programme adopts a fertile across-the-board approach, and includes many high quality courses in the fields of business strategy, finance, logistics and human resources, among others. It also provides students with tailored support via coaching sessions with a top flight teaching team. The programme also explores other business organisations through discussion and sharing experiences with the class during the courses and the group work. EDHEC Executive MBA programme gave me a solid foundation of skills and know-how to manage and unite a team. It helped me to develop a global approach and to make pertinent decisions. It taught me to see the big picture and to be objective and revealed my leadership style. Today, I try to bring out the best in each individual in my management practices. I’m also aware of the need to continually learn, and to cultivate self learning. (including 4 500€ excl. VAT for the 2 Global Business Trips). This programme is eligible for the French personal training account scheme (CPF) - Code 245001. 3 800€ reduction from tuition fees for all applications submitted before 31/05 for the programme starting in the new academic year September and before 15/10 for the February session. There are 3 types of scholarships offering reductions of up to 8 500€. * Residents are foreign nationals living in France. * Applicants seeking a scholarship in the context of a company start-up or takeover project must be able to defend his or her plan in front of an admissions panel. This scholarship is reserved for applicants looking for a career change or between jobs. The scholarship is awarded following an assessment by the scholarship award board. The amount can go up to 10% discount on the share of personal financing. NB : only one scholarship is applicable for a programme. If two or several criteria are met, the highest reduction will apply. EDHEC Executive Education and MBA programmes are underpinned by the know-how and expertise of the school’s top-flight teaching faculty of academics and business professionals. EDHEC offers a unique learning environment that promotes the acquisition of technical skills and personal and professional transformation through its innovative and dynamic teaching methods.